Do you need to enable video on a Fanvil C600? This blog will show you how to enable video on a Fanvil C600 step by step. 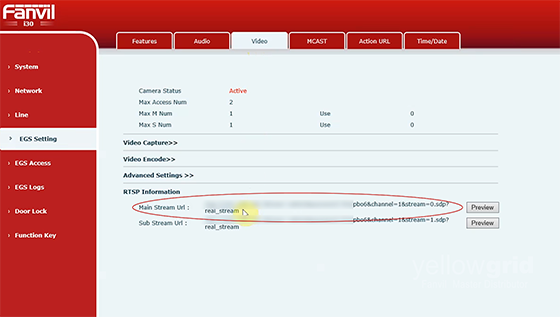 On the web interface go to EGS settings – video and under RTSP information copy the main stream URL. On the web interface go to: phone – action plan and under ‘action plan add’, you need to fill in the relevant details where digit map is the extension of your door phone. There are two ways you can configure video display on your Fanvil C600 using action plans. 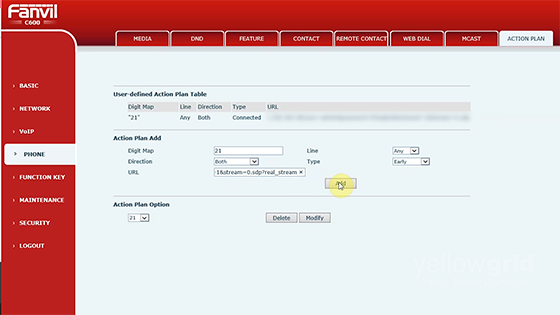 Set the action plan type to ‘connected’, this follows the same behaviour as the Fanvil X6 where you can see the video once the call is connected. Change the direction from ‘incoming calls’ to ‘both’. 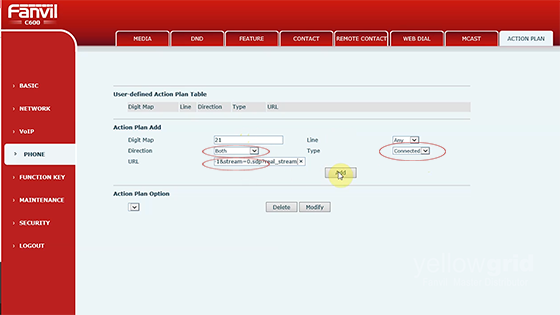 This allows the action plan to work on both incoming and outgoing calls. Paste the RTSP stream URL (copied from the EGS settings of the door phone) into the URL field. 2nd Option – The Fanvil C600 has a useful capability that enables you to see the video before answering the call. This is called ‘early’. Set the action plan type to ‘early’. Set the direction to ‘both’. Video on the Fanvil C600 should now be enabled, if you are still having trouble enabling this feature please do not hesitate to give our office a call on 0333 014 4340.